Place the mince and onion in a large saucepan and fry for 5 minutes. Add the Worcestershire sauce, 100ml water and seasoning and fry for a further 5 minutes, covered. Transfer to an ovenproof serving dish. Rub the butter into the flour until it resembles breadcrumbs. Stir in the oats and cheese, season to taste. 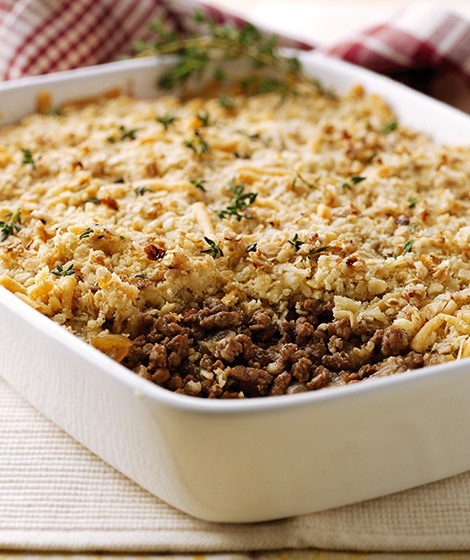 Sprinkle over the mince and bake for 20-25 minutes. Try adding some peas or frozen mixed vegetables to the mix. "Definitely, what a fantastic website and enlightening posts, I will bookmark your site.Best Regards!" "I am a very experienced cook who makes a fruit crumble regularly. I am currently recovering from a total knee replacement and rely on my partner doing some shopping - something he hates. Today I found I was pretty short on ingredients for tonight's dinner, but I had some fresh mince. My partner loves anything made with mince, as he is too lazy to cut his food!!! As I have got really bored with my usual recipes I found this - great, I thought. However, even though everything was done exactly as stated, he hated the texture and I had to agree. Sorry. It might be better if the crumble topping was baked thinly spread on a baking tray until it is all golden, but I'm not prepared to spend time making it." "Ah shame you didn't like the recipe as much as we did. This is a good tip some people might like to try, thank you!" "Add quartered mushroom & finely chopped celery for texture." "A good suggestion to try - thanks!"